You must provide documentation that you are a certified diver in order to fill a SCUBA cylinder. Additional certifications are required for Nitrox and Trimix fills. Do I need a diving certification in order to get a sport diving gas fill? Yes. To receive an Air fill, we require a SCUBA diving certification. To receive a fill with any Nitrox mixture of 40% or less Oxygen content, we require a Nitrox Diver certification. What type of certification must I have to get a technical diving gas fill? To receive a fill with any hyperoxic mixture greater than 40% Oxygen content (including pure Oxygen), we require a Technical Diver or equivalent certification. To receive a fill with Helium mixtures, a Trimix Diver or equivalent certification is required. We will observe any specific mixture restrictions that appear on your C-card. We interpret Normoxic Trimix to mean a Helium mixture with an Oxygen content between 18% and 24%. What if someone else is getting fills on my behalf, and they don’t have the appropriate certification?Unless you have made prior arrangements, we will not allow anyone who lacks appropriate certification to receive a cylinder. In particular with breathing gases other than air, because divers should always analyze and label their own cylinder contents, those divers should be the ones picking up the cylinders. When exactly does my visual inspection (“VIP”) or hydrostatic test (“hydro”) expire? By law, a Transport Canada (TC) required hydrostatic test expires five years (60 months) following the test and the annual VIP’s expire one year (12 months) following the inspection. Because neither a visual inspection sticker nor hydro retest mark typically show the day of the month performed, a long established and widespread practice in the SCUBA industry has been the valid period expires on the first day of the month shown. Recently, TC/DOT has issued a clarification statement that the hydrostatic test officially expires on the last day of the month shown. However, we recommend re-qualifying your cylinder before the first day of the expiring month, because most dive shops continue to observe the more conservative expiration date. Aquarius Scuba Diving Centre will not fill any cylinder after the last day of the month in which the visual inspection or hydrostatic test expired. What cylinders require an interior inspection before Aquarius Scuba Diving Centre will fill them? Are there any exceptions to your cylinder qualification requirements? We fill the small 2L, 3L and 4L Faber steel cylinders used in Evolution, Inspiration and Dräger rebreathers. Although these cylinders lack a DOT stamp, we fill them to a maximum of 200-Bar (3000 psi) if they have a current hydro test and evidence of visual inspection sticker. We will NOT fill the stainless steel welded ball pressure vessels used in the Mark 15 rebreathers. Will you fill 6351 T6 Aluminum cylinders? Effective immediately, Aquarius Scuba Diving Centre will no longer fill any aluminum scuba cylinder made from 6351 T6 Alloy. This is due to the large amount of tanks we have received with current Visual Inspection that showed visible cracking in the neck area. *Please note, Catalina Cylinders were never made from 6351 T6 alloy. What is the procedure for leaving a cylinder to be filled? When you drop off one or more cylinders to be filled, we will prepare a work order tag to indicate your desired final contents and pressure along with your name and contact information. The work order tag is attached to the cylinder and, upon request, you receive a numbered claim check. What if I don’t have my claim check when picking up cylinders? If a claim check was issued, we will not release the cylinders until the claim check is produced. If you can’t find the claim check, we will accept your photo identification as long as it matches the name on the work order tag. Please make prior arrangements if someone else will be picking up the cylinder and they won’t have the claim check. How fast do you fill my cylinder? Our target fill rate is 500 psi per minute. This means that the standard aluminum 80-cubic-foot cylinder with 500 psi residual takes approximately five minutes to fill. In addition to extending cylinder life, at this fill rate, there is not enough heat created to significantly affect the final pressure. “Filling Cylinders in Water–Time to Review” by Bill High, President of Professional Scuba Inspectors, Inc.
Will you fill my cylinder to more than its rated maximum pressure? Aquarius Scuba Diving Centre does not overfill any cylinder. Overfilling shortens cylinder life, as well as increases risk of cylinder failure. Increased pressures also can cause burst disks, O-rings, and 1st stage regulator seats to unexpectedly fail prematurely. Do you partial-pressure blend in my cylinder? Infrequently, except for trimix and custom nitrox mixes. We have the capability of partial-pressure blending in your cylinder. We produce Nitrox using a process known as membrane separation. What are your standard gases? The Nitrox gases we bank in large volumes are 21% (oxygen compatible air) and 32% Nitrox. We also have large banks of Pure Oxygen and Pure Helium. We have small banks of Pure Argon for dry suit inflation. We also offer any blends of Nitrox, Helitrox, and Trimix. Why do you have standard gases? Our standard gases are based on gases that we bank or are fast for us to blend. It’s quick to make Nitrox 27% because that is a mixture of half Nitrox 32% and half Air. For extremely deep diving, it’s also very fast to blend Trimix 18/45 or 15/55 because we need only add more Helium. Also by adding just Nitrox 32% and/or Helium, we can quickly change residuals of any of our standard Trimix blends to another of our standard blends. This approach to making our standard blends allows us to greatly reduce the amount of our handling and boosting high pressure oxygen. For these blends the math is so simple we can do it at the fill panel without stopping to use a calculator or spreadsheet. Another benefit is we have observed our process of making these blends requires little or no waiting for the gases to mix, and the analysis result is always right on target. Finally, all these other benefits produce the ultimate practical benefit of saving everyone’s time and your money. What if I want a non-standard blend? Of course we can provide ANY mixture you need, but please allow us extra time for any custom blends. Our standard blends are reasonable choices for practically all of the sport and technical diving performed in our area. Realistically, the practical benefit of saving time and money by using our standard blends outweighs the minor benefit to small reductions of decompression time that can be accomplished with custom mix for a specific dive profile. We are happy to show you how you can use our standard blends to do your dive and to save you time and money, but we also understand that some exceptionally deep or long dives may demand gases other than our standard blends. What is the quality of your Air and Nitrox? An independent laboratory MAXXAM Analytics is used to ensure that our Air and Nitrox meet CSA standards for carbon monoxide, methane, moisture, oil, particulates, and odor. Our compressors incorporate a variety of filter systems that allow us to produce and store gases that meet both the CSA Z180.1 and CSA Z275.2 compressed breathing air/gas standards. What is the quality of your Oxygen? Our Oxygen meets a standard known as Medical and is required to be 99.5 percent pure. The water vapor content must not be more than 27 ppm with an atmospheric dew point of -53°C. Our oxygen consistently tests at 100% as delivered to us from our supplier. However as we trans fill the MBO into customer cylinders there will be small amounts of other breathing gases introduced from the plumbing of the boosters and fill whips. Particularly where the cylinder being filled is small, the final content should be considered slightly less than 100%. For the purposes of setting dive computers or decompression software, we recommend using a value of 99% for the actual purity. What is the quality of your Helium? There is no widely recognized gas purity standard for Helium. We purchase medical NOT industrial grade Helium that our specialty gas supplier calls Ultra High Purity and is 99.98% pure. According to our gas supplier, the price of Ultra High Purity Helium is about double the price of what are known as industrial, welding and balloon grades of Helium. We chose not to use those lesser grades of helium because they are commonly contaminated with methane, nitrogen, and sometimes with argon. How can I be certain about my cylinder contents? We have a simple but effective system to assure you know what is in your cylinder. A work order tag is placed on the cylinder to indicate the desired final contents and pressure. The work order tag provides the fill station operator with a clear visual indication of what gas to put in the cylinder. Once the cylinder is filled, we assist you in performing an analysis of the cylinder contents in your presence. Finally, we affix a strip of adhesive “tank tape” marked with your analysis. This is true for all Air, Nitrox, Trimix and Oxygen fills. What cylinder contents labels do you recommend? Unlabeled cylinders are assumed to contain air. For cylinders containing a gas other than air, our recommendations differ depending upon the intended use and type of gas. In sport diving, we recommend (but do not require) cylinders containing Nitrox with oxygen concentrations of 40% or less should be labeled with a color-coded, 6-inch-wide band. The top 1 inch and the bottom 1 inch of the band should be yellow. The middle of the band should be green with the wordNitrox in yellow. Cylinders containing Nitrox less than or equal to 40% should be labeled with the words Nitrox orBreathing Gas Other Than Air. Cylinders containing Nitrox between 41% and 74% should be labeled with the wordsDecompression Mix or Breathing Gas Other Than Air. Cylinders containing oxygen concentrations of 75% or greater should be labeled with the wordOxygen. Cylinders containing Trimix should be labeled with the word Trimix or Breathing Gas Other Than Air. Cylinders containing Argon should be labeled with the word Argon AND the words DO NOT BREATHE. All cylinders containing breathing gas other than air should have a label or tag indicating the oxygen percentage currently in the cylinder and the maximum operating depth (MOD). In addition, cylinders containing mixtures with MODs less than 100 feet should have the MOD marked in 3-inch-high numbers such that the MOD is clearly visible during the dive. What cylinder contents labels do you require? We think labels and stickers on SCUBA cylinders are in some ways counter productive because they encourage and obscure corrosion. We require all cylinders containing a breathing gas other than air to have a label or tag indicating the oxygen percentage currently in the cylinder. We require Argon cylinders to be clearly marked with the words DO NOT BREATHE. What cylinder contents labels do you obey? Filling a cylinder with a breathing gas other than is labeled can create dangerous situations where the contents might be used under the assumption it’s actual contents match the labeling. If a cylinder has been dedicated to a specific breathing gas with permanent MOD or contents labels, we will fill that cylinder only with the labeled gas. For example, if the cylinder is labeled “Oxygen 20 ft.” we will fill only with 100% Oxygen or if the cylinder is labeled with “70” maximum operating depth we will fill only with 50% Oxygen. If you wish a fill with other than the permanent contents label, the label must be removed or obscured (i.e. covered with tape). Do you sell Air? Yes, but we call it Oxygen-Compatible Air (also known as Normoxic Nitrox). We use the same oxygen-compatible compressors, filters, and gas-handling procedures to make our Air as we do our oxygen-enriched Nitrox mixtures. Our Air and Nitrox both meet the same Ultra Pure quality requirements of the CSA Z275.2 and Z180.1 standards. Air is normally expected to have 20.9% Oxygen content. Will you fill my Nitrox cylinder with Air? Yes. We can fill your Nitrox cylinder with Normoxic Nitrox (also known as Oxygen-Compatible Air). This means we will follow our policies and procedures as for any other Nitrox mixture: the cylinder contents must be analyzed and a contents label affixed to the cylinder. The diver must also handle the cylinder as Nitrox, meaning they should take care to always know the oxygen content and MOD of the gas they are actually breathing. What do Nitrox Ready and Oxygen Service mean? When the SCUBA diving community prepares an item for use with breathing gases containing high oxygen percentages or pure oxygen, they generally think in terms of washing it with detergents, replacing rubber parts such as O-rings and seals with oxygen-compatible equivalents and reassembling with oxygen-compatible lubricants. However, most other industries working with very high-pressure oxygen have a very different standard known as oxygen service. Oxygen Compatible — compatible with high concentrations of oxygen. Oxygen Clean — free of hydrocarbon contamination and particulate matter. True oxygen cleaning of an oxygen compatible component (often made from exotic metal alloys or other compounds) takes place in a special clean room, whose atmosphere is free of dust and contaminants. Once the component is free of hydrocarbons and other combustible elements, it is sealed within a sterile environment and never again exposed to normal atmospheric dust, moisture, and contaminants. Only then is the item said to be suitable for oxygen service. Some manufacturers offer diving products labeled Nitrox Ready, whose oxygen-compatible components are free of hydrocarbons and other flammable contaminants. The metal components are usually stainless steel or brass, which are suitable for use with oxygen at the pressures encountered in diving activities. The lubricant used in assembly is Christo-Lube® or other oxygen-compatible lubricants. The O-rings are made from Viton® or other oxygen-compatible materials. 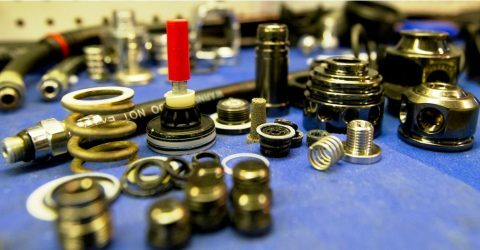 These components are not, however, assembled in a clean room or sealed in a sterile environment. As a result, the manufacturers do not label the products as suitable for oxygen service, although many divers consider them to meet oxygen service criteria at pressures encountered in the diving community. How do I get my cylinder and valve to be Nitrox Ready? Most cylinders and valves that have been in use have some level of hydrocarbon contamination. To make a cylinder and valve suitable for nitrox service, they must be disassembled and cleaned of hydrocarbon contamination and reassembled with oxygen-compatible O-rings and lubricant. This process requires training, special materials and is time-consuming. For a very reasonable fee, Aquarius Scuba Diving Centre can prepare your cylinder and valve for nitrox service. New cylinders and valves purchased from Aquarius Scuba Diving Centre are always prepared by the factory for nitrox service using facilities not available to local dive shops. These new cylinders and valves will never be any cleaner than the day they are put into service. How do I know that my cylinder and valve are Nitrox Ready? Once a cylinder and valve have been prepared for nitrox service, a special sticker (or often a special version of the evidence of visual inspection sticker) is affixed to the cylinder. Unless the sticker explicitly states that a cylinder and valve are suitable for nitrox service, they are not. If the cylinder is ever filled with anything other than Oxygen-Compatible breathing gases, it is no longer suitable for nitrox service, and the sticker should be removed. Even with the best quality fills, hydrocarbon contamination can build up over time. Aquarius Scuba Diving Centre recommends that the cylinder and valve should be prepared for nitrox service each time the cylinder is visually inspected (yearly). What does the large green and yellow Nitrox decal mean? Per PSI standards, presence of a color-coded 6-inch-wide green and yellow NITROX band decal indicates only that the cylinder contents are Nitrox. The large NITROX band does not indicate the cleanliness of the cylinder, its suitability for partial pressure blending, or what method was used to fill the cylinder. It is only the evidence of inspection sticker that indicates if a cylinder and valve are Nitrox Ready. When does my cylinder or valve need to be Nitrox Ready? 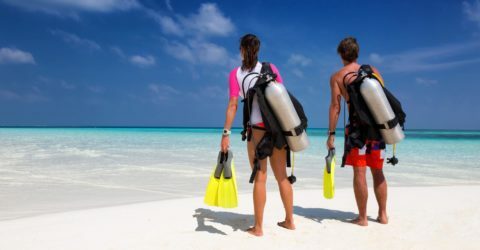 The recreational diving industry has widely followed what is often referred to as the “40% Rule” which states the cylinder and valve must be Nitrox Ready only when they will be exposed to a gas mixture containing more than 40% oxygen. While banked sport diving Nitrox or technical diving Trimix don’t absolutely require that the cylinder and valve be Nitrox Ready, many fill stations blend directly in the tank by first adding 100% oxygen and then topping off with oxygen compatible air. This process, known as partial-pressure blending, requires that the cylinder and valve be Nitrox Ready. In practice, almost all Trimix cylinders are Nitrox Ready because partial-pressure filling is so common. You should keep in mind that not everyone agrees with the 40% rule. Luxfer has an extremely detailed statement of their position on aluminum cylinders and oxygen which argues any cylinder that contacts more than 23.5% should be oxygen clean. Does Aquarius Scuba Diving Centre require that my Nitrox cylinder be suitable for nitrox service? Aquarius Scuba Diving Centre recommends, but does not require, all cylinders used for breathing gases other than air should be Nitrox Ready. 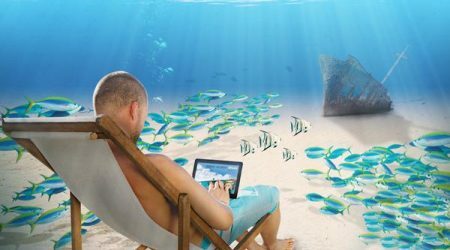 Aquarius Scuba Diving Centre follows the “40% Rule” guidelines of our training agency affiliation with PADI/TDI/IANTD. This means any premix Nitrox at Aquarius Scuba Diving Centre less than or equal to 40%, does NOT require that your cylinder and valve be Nitrox Ready because our Nitrox is premixed before entering your cylinder, not partial-pressure blended with 100% Oxygen in your cylinder. Any Nitrox exceeding 40%, DOES require that your cylinder and valve be Nitrox Ready. Does Aquarius Scuba Diving Centre require my Trimix cylinder be suitable for nitrox service?Yes because our Trimix gases are produced using partial-pressure blending which requires that your cylinder and valve be suitable for nitrox service. Does Nitrox generated using membrane separation contaminate my Nitrox Ready cylinder?Usually, but not at Aquarius Scuba Diving Centre. Most premix Nitrox produced using membrane separation only meets what is known as the CGA Grade E quality verification level. Filling any cylinder with CGA Grade “E” quality Nitrox will introduce hydrocarbon contamination such that the cylinder is not considered O2 clean and may not later be used for partial-pressure blending. This is true even if the cylinder was previously Nitrox Ready. However, our extra filtration allows us to deliver our gases meeting the more stringent purity specification known as “Oxygen-Compatible”. Because of the extra filtration, Aquarius Scuba Diving Centre premix Nitrox will not contaminate your cylinder. Will any fill or VIP at Aquarius Scuba Diving Centre contaminate my Nitrox Ready cylinder? No, cylinder filling or visual inspection procedure at Aquarius Scuba Diving Centre will change the cleanliness state of the cylinder. All our gases, premix and custom are Ultra Pure and oxygen compatible. Aquarius Scuba Diving Centre only uses service materials, such as o-rings and lubricants, which are oxygen compatible. If your cylinder was Nitrox Ready when it entered Aquarius Scuba Diving Centre, it will still be Nitrox Ready when it leaves Aquarius Scuba Diving Centre.